Four Ways to Avoid “Post-Disruption Stress Disorder"
New technology drives new expectations. You need a new strategy, good for 2017 and beyond. Grow profitably and stay competitive with Extreme Trust. Four tasks to do so. How to map the customer experience, improve it, profit from it. How does it help us and help our customers? Why is “customer journey mapping” exactly what’s needed now? Providing a better customer experience is costly today, while value is realized tomorrow. 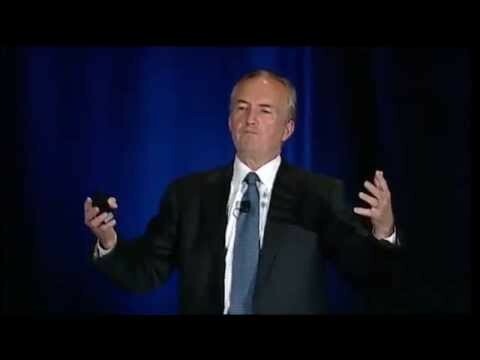 Resolve this dilemma to the satisfaction of your CFO. How much more will customers pay if…? The pinnacle of Customer Success Management is customer advocacy. How to create emotional, human bonds with customers, at scale, and leapfrog your competitors to own the category. Don Peppers’ Key Accomplishments Include . . . 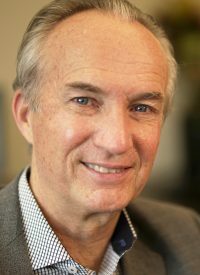 Recognized as one of the world’s leading authorities on customer-focused business strategies, Don Peppers is an acclaimed author and co-founder of the management consultant firm, Peppers & Rogers Group. His new company, CX Speakers, delivers workshops, keynote presentations and thought leadership consulting focused on customer experience topics. Thought Leader — Originated the 1 to 1 marketing philosophy which is as relevant today as it was 20 years ago. Author of 9 books. 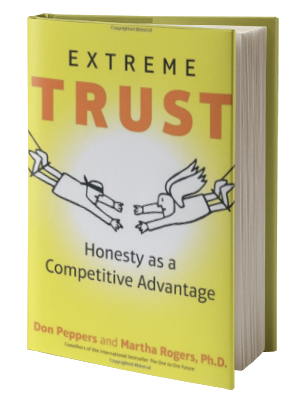 Latest book – Extreme Trust: Honesty as a Competitive Advantage posits that social networks and rapidly increasing transparency raises customer expectations regarding the trustworthiness of the companies they deal with. Don Peppers’ work routinely examines the business issues that today’s global enterprises are grappling with while trying to maintain a competitive edge in their marketplace. 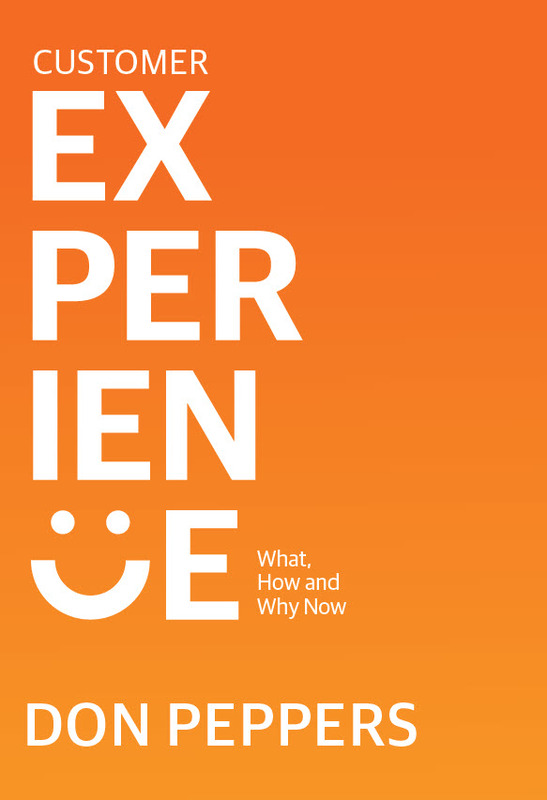 In 2016, he released his 11th book, Customer Experience: What, How and Why Now, a collection of bite-sized essays offering insights and “how to” recommendations on building and maintaining a customer-centric business. It uses real world examples to cover not just the central issue of customer experience, but also corporate culture, strategy, technology, and data analytics. With business partner Dr. Martha Rogers, Peppers has produced a legacy of international best-sellers that collectively sold well over a million copies in 18 languages. 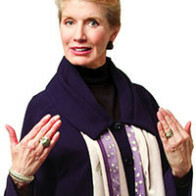 Their first book, The One to One Future (Doubleday, 1993), was called by Inc. Magazine’s editor-in-chief “one of the two or three most important business books ever written,” while Business Week said it was the “bible of the customer strategy revolution.” As a testament to this, Don Peppers and Martha Rogers were inducted into the Direct Marketing Association Hall of Fame in 2013. Peppers’ and Rogers’ ninth book together is Extreme Trust: Turning Proactive Honesty and Flawless Execution into Long-Term Profits (Penguin, 2016). And in 2017, Wiley Publishers released the third edition of their graduate school textbook, Managing Customer Experience and Relationships: A Strategic Perspective, originally published in 2003. With over 300,000 followers for his regular postings of original content on LinkedIn, Don has been listed numerous times on LinkedIn as one of the Top 10 Marketing Influencers. In 2015, Satmetrix listed Don and Martha Rogers #1 on their list of the Top 25 most influential customer experience leaders. 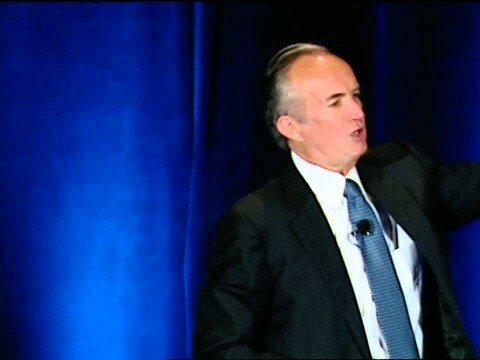 The Times of London included Don on its list of the “Top 50 Business Brains,” and Accenture’s Institute for Strategic Change listed Don as one of the 50 “most important living business thinkers” in the world. 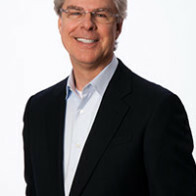 Prior to founding CX Speakers and Peppers & Rogers Group, Don served as the CEO of a top-20 direct marketing agency (Perkins/Butler Direct Marketing, a division of Chiat/Day), and his 1995 book, Life’s a Pitch: Then You Buy (1995), chronicles his exploits as a celebrated business rainmaker in the advertising industry. 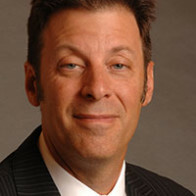 Before his career on Madison Avenue he worked as an economist in the oil industry and as the director of accounting for a regional airline. He holds a B.S. in astronautical engineering from the U.S. Air Force Academy and a Master’s in Public Affairs from Princeton University’s Woodrow Wilson School. He is a competitive runner and happily married father of five. Customer loyalty is a misunderstood and abused marketing idea that has by now lost nearly all connection to business reality. We all know that having loyal customers must be beneficial to a business. And as customers ourselves, we know what it means to be loyal to our favorite products, services, and brands. But few companies are genuinely good at maintaining and improving customer loyalty, tracking it, or measuring its actual benefits. This workshop is designed to help consumer-facing businesses improve the loyalty of the customers they sell to. Note: While this agenda is topically accurate, all sessions and exercises in this workshop will be tailored to the needs of the client company. Session 1. What is Customer Loyalty, and Why Does It Matter? Before any serious customer loyalty improvement effort can be successful we need to know what success looks like. But this will depend on how we define the problem to begin with. So in Session 1, we’ll first review two conflicting definitions of customer loyalty and discuss how they’re related. Then we’ll learn how to track and evaluate each type. What’s your Return on Customer? In the United States, there are three and a half billion individual loyalty club memberships, which amounts to more than 30 for every American household. Not just airlines and hotel chains, but retail stores, credit cards, banks, and other consumer marketing companies in virtually every business category have loyalty programs. But fewer than half of these billions of memberships are active. So what makes for a good loyalty program – one that can actually help a company improve the loyalty of its customers? And is there any business, industry, or category in which having a loyalty program may not be the right idea? Some companies try to buy their customers’ loyalty with points and awards. But if you can establish Learning Relationships with your individual customers – that is, relationships that are based on constantly improving the “context” of the relationship – then you won’t have to buy your customers’ loyalty at all. Instead, you can sell it to them. You can’t write a line of code or a business process rule that will guarantee that an employee will delight the customer. The employee must want to delight the customer. In the final analysis, your customers’ loyalty to you will be in the hands of front line, customer-facing workers. Whether these are retail clerks, or service technicians, or contact-center associates, your employees level of engagement will have a direct effect on customer loyalty. First, are you loyal to your customers? Consumers no longer rely principally on advertising to learn about products and services they might want. Instead, they seek out information online – not just from a brand itself, but from third-party review sites, subject matter experts they find online, and their own social media connections. Nearly 90% of Americans report they do online research before buying virtually anything new, while 75% check product reviews first, and 80% use a smartphone to help with shopping. If at least some of your current customers have a genuine emotional affection for your brand, and are willing to advocate on your behalf to other consumers, you will have a tremendous leg up in the new environment, an environment in which everyone is connected to everyone, 24/7. This workshop is designed to show you how to make it happen. Genuine, enthusiastic customer advocacy is generated only when a customer has connected on an emotional level with a product, brand or service. And you can’t make an emotional connection with a customer unless you’ve first removed all the friction from the customer experience. Customer advocates are loyal not just to a brand, but to the people they see who represent the brand. So front-line employees – retail clerks, contact center associates, sales consultants, and even service technicians – are all critical to the success of any customer advocacy effort. Your employees’ level of engagement will have a direct effect on the success of your customer advocacy initiatives. A lot of traditional, widely accepted and perfectly legal business practices just can’t be trusted by customers and will soon become extinct, driven to dust by rising levels of transparency and increasing consumer demand for fair treatment, and competitive pressure. Any business that fails to prepare for this new reality will soon be competed out of business by rivals who figure out how to make a greater profit by doing a better job of earning the trust of their customers. Ask yourself: If anyone measured the relative trustability of all the companies in your industry, how would you score? What do you need to do to get to the top and stay there? Session 1. What is Trustability, and Why Does It Matter? Transparency is increasing because of inevitable technological pressure. It can’t be stopped, averted, or slowed down. Especially the technologies that heighten and magnify our connectedness as people. It requires “proactive trustworthiness,” or Trustability. Before any serious improvement effort for increased trustability can be successful, we need to know what success looks like. So in Session 1, we’ll first review the essential elements of trustability and how trustability differs from mere trustworthiness. Table Exercise: How Trustable Is Your Company? Customers are willing to pay more to do business with companies they trust. How much more? It’s different in different industries and markets, but it’s universally true. Relationships are the link to long-term shareholder value and plain old profits, and that makes Trustability a capitalist tool. 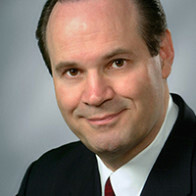 Stephen M.R. Covey said that we measure ourselves by our intentions and others by their behavior. So no matter how good our intentions are to do things right and do the right thing, all that matters is the customer’s experience with us. That’s the experience they will share with a gazillion of their closest friends online. How will businesses operate competently, fairly, and proactively in the near future? And how will they know it’s working? How do we build Trustability into our KPIs? What Would Proactivity Look Like In Your Business? What you measure guarantees what you will get. Which of your KPIs encourage Trustability? And which diminish Trustability? Group Exercise: Which Measures for Us? Which Measures Build Trustability?